– Time for an upgrade in your optimization tool box? As a SOLIDWORKS Design Study user, do you have the best optimization tool in your toolkit? 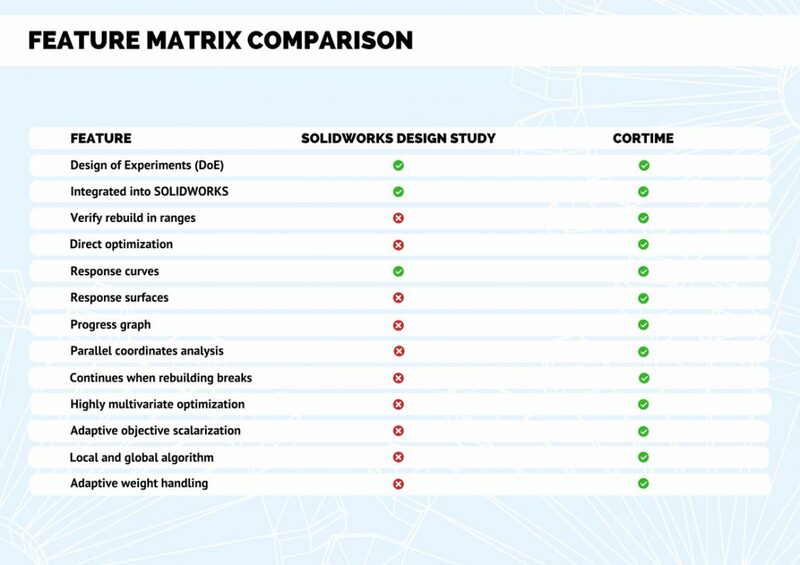 In this blog post, we’ll give you the main conclusions from our white paper in which we evaluate how SOLIDWORKS Design Study compares to CORTIME. Our evaluation is primarily centered around usability and optimization technology – two elements which can drain your development time and give you subpar optimizations. Read on to see if you agree that it is time for an optimization upgrade! With product development increasingly becoming more complex, engineers are constantly looking for tools to make their development process more efficient. In terms of optimization tools, the SOLIDWORKS Design Study has for long been a natural choice. 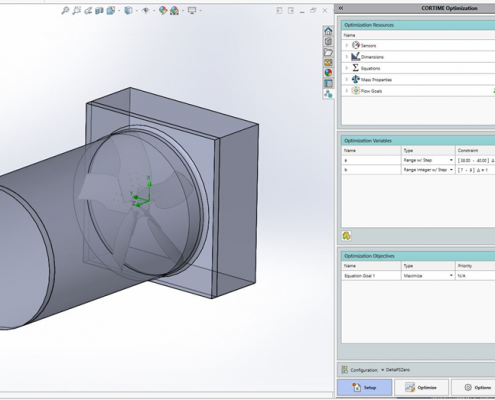 For SOLIDWORKS Simulation users it is standard and it has the ability to test different design scenarios. But as a SOLIDWORKS Design Study user you have to ask yourself: “do I have the most valuable optimization tool at my disposal?” We have compiled a few arguments for why you should upgrade your optimization tool. 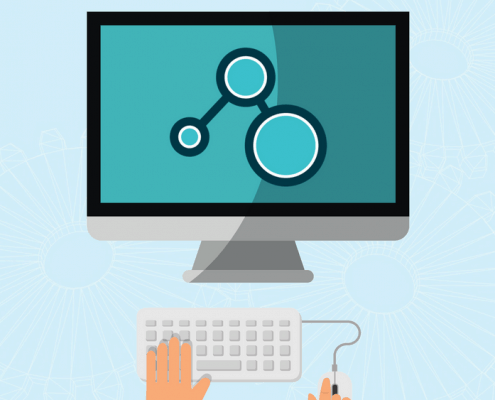 What makes a great optimization tool? At the bottom line it is when we become more productive and efficient than without it. The learning curve can’t be too steep either – we simply don’t have time for that (this survey shows that a 4 week productivity loss is normal when learning a new software but from then on you should gradually become more efficient than before.) In our minds we are constantly making cost/benefit analyses about what we use in our everyday and that includes optimization software. 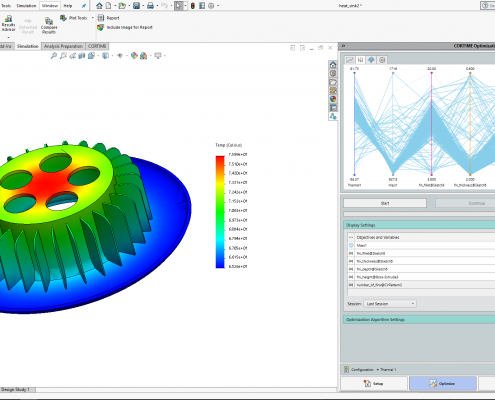 So the question is, how does SOLIDWORKS Design Study perform in such an analysis? From a usability standpoint, there is room for improvement. Aside from the slightly clunky interface, one of the biggest issues are how SOLIDWORKS Design Study deals with rebuild errors. If one or more references in your CAD model are broken, you lose all your results and data progression. This is due to one or more broken references, which it isn’t able to rebuild to continue optimizing. Without any indication as to why your model doesn’t rebuild, you have to manually change your design without any tools to get the valuable insight or data to do it properly the first time. Furthermore, there is a distinct lack of data analysis options in SOLIDWORKS Design Study. You get presented with the results in a spreadsheet but there is no way of segmenting the results. This essentially limits your understanding of your solution space. Looking at the technology, there are also issues which can seriously affect your performance goals. SOLIDWORKS Design Study is based on a Design of Experiments (DoE) method. The optimization tool claims to find “the optimum design according to goals or two objective functions, design variables, and constraints”. While this is true, successful optimizations are contingent upon a number limiting factors. For instance, it requires few variables, limited ranges and, in turn, is only able to solve simple problems. Although it claims to find the most optimal design, it isn’t accurate in its approach to defined limitations and objectives. You risk getting insufficient results from your optimization and no explanation as to why a given design concept is determined to be the optimal solution. To get better optimization results, you have to define which variables and objectives to work with. By limiting the number of variables and objectives however, it will limit your design space and oversimplify your model. In other words, you might end up of spending time and effort on exploring designs which could be optimized further by modern optimization algorithms. Whether you have to design a new product or reconstruct existing ones, SOLIDWORKS Design Study’s insufficient technology and usability makes it more challenging to find better designs. 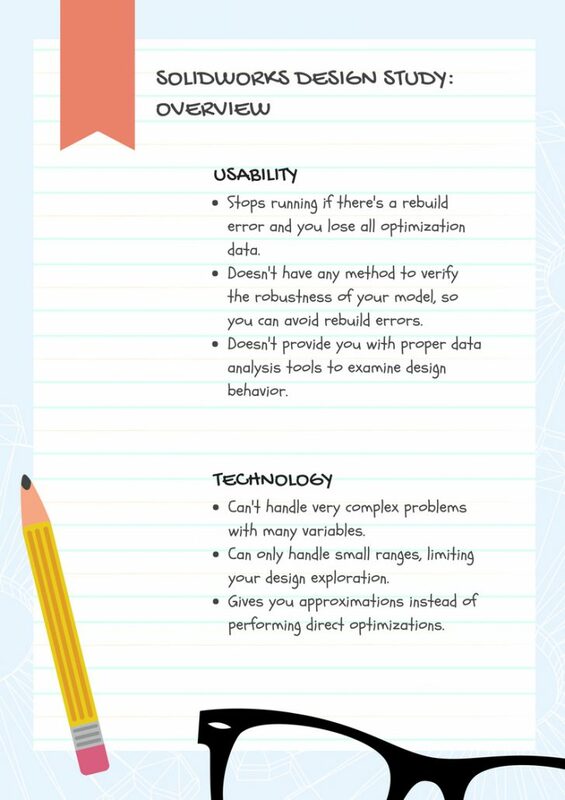 Usability-wise it is a “Goldilocks tool” where everything has to be just right for an optimization to be successful. But even then you might not end up with proper optimization because of lacking technology. It begs the question whether SOLIDWORKS Design Study is worth your time? 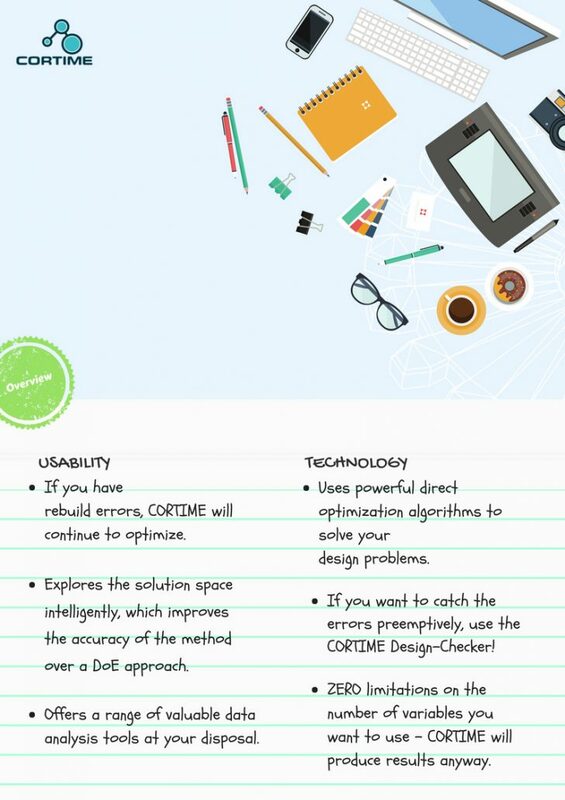 Technology and usability, the CORTIME way! Luckily, there is a tool out there which addresses all of these issues. CORTIME, it’s an intuitive computer-aided-optimization (CAO)-tool tailored to blend in with the busy workflow of the modern product developer. CORTIME has an easy and intuitive interface containing everything you need to run an optimization. You can preemptively catch rebuild errors by using the CORTIME Design Checker. Even if a rebuild error occurs during the optimization, this is detected, rejected and taken into account when generating new designs. This means that you will always keep your optimization data and the progress made. Once the optimization is complete, you will, as mentioned, have a wide range of valuable data analysis tools at hand to gather all the pearls of wisdom. 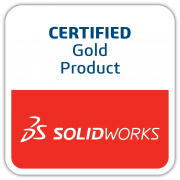 No shortage of data options, making you an even better SOLIDWORKS user. Technologically, CORTIME uses powerful direct optimization algorithms to solve your design problems. The default optimization algorithm is inspired by the annealing process from nature. It explores the solution space intelligently, which improves the accuracy of the method over a DoE approach since test points are not estimated from a response curve. Practically, this means there are no limitations on the number of variables you want to use – CORTIME will produce results anyway. There are no restrictions regarding the ranges either, which means you will be able to explore designs you could not do with SOLIDWORKS Design Study. A step towards ultimate workflow! CORTIME allows you to explore countless iterations, based on one design concept, and extends your design space’s capabilities when important design choices have to be made. Both in terms of usability and optimization technology, CORTIME outperforms SOLIDWORKS Design Study. By using CORTIME, you will get better optimizations and spend less time dealing with usability problems such as rebuild errors. CORTIME will simply make you a more effective product developer. For an in-depth analysis of SOLIDWORKS Design Study vs. CORTIME, download the white paper. You can also schedule a CORTIME demonstration with one of our experts right away!